You may have a personal LinkedIn profile, but is your organization leveraging “LinkedIn’s 175+ million strong network of professionals” to promote your mission, engage supporters and identify and connect with volunteers? If not, now might be a good time to take a closer look. LinkedIn launched a number of enhancements during September and early October that make this social media platform more effective for individuals and organizations. In an earlier post - Can LinkedIn Recommendations Grow Your Membership? - we talked about creating “company pages” for your non-profit or membership organization. Since then, LinkedIn has rolled-out re-designed company pages that offer a new look and additional functionality. The LinkedIn Blog offers details and a video you can watch here. If your organization doesn’t have a Company Page, you can find out how to create one through LinkedIn’s Help Center - Adding a Company Page. Board Connect [will help] nonprofits transform themselves into networked nonprofits by finding and recruiting board members using a networked approach. Leveraging their own networks as well as their board members’ networks, nonprofit leaders now have free access to a premium LinkedIn feature that lets them search for and connect with professionals who meet the needs of their organization on LinkedIn. 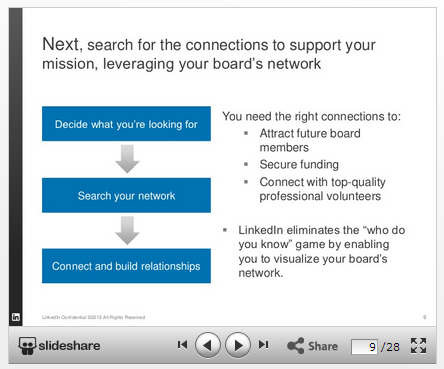 As you can see in the slide (below) from the LinkedIn SlideShare presentation, you can identify the skills or profile of the volunteer or Board member you are seeking and use this LinkedIn feature to search your network to screen and connect with potential candidates. For more details on Board Connect, you can check out this LinkedIn video. 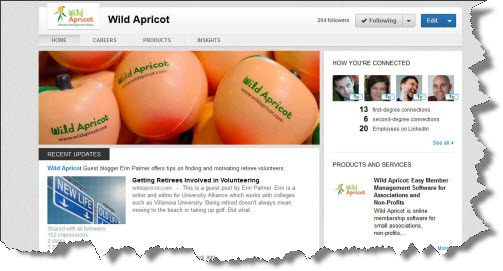 As the Nonprofit Quarterly recently noted, LinkedIn’s “recent makeover includes a new “follow” feature similar to what other social networks, notably Twitter, have offered. The site will now allow users to follow some 150 thought leaders that they aren’t directly connected to, allowing followers to see their public posts.” Some of the nonprofit “thought leaders” identified include Beth Kanter and Katya Andresen. Getting interested? Want More On LinkedIn? 4 Ways to Leverage Word-of-Mouth Marketing Using Social Media - this post offers suggestions as to how you can used LinkedIn (and other social media) to spread the word about your organization. LinkedIn’s own blog and Learning Center are full of helpful suggestions so you can make the most of your use of the network. 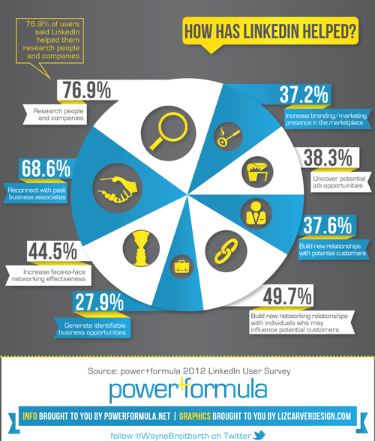 The infographic we excerpted at the beginning of this post - created by powerforumula - offers some insight into who is using LInkedIn and how it has helped. You can check out the full infographic on the powerforumula website here.